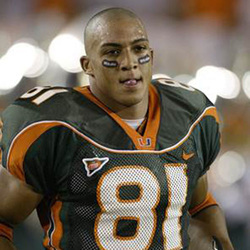 When you are the son of an NFL Hall of Famer who is considered one of the greatest tight ends ever to play the game, many would choose another position or even another sport, but Kellen Winslow, Jr. buckled up his chinstrap, followed in his father’s footsteps and earned the distinction as the best tight end in college football. Kellen came to Miami from California having excelled on both sides of the ball and was even named his conference’s Defensive Player of the Year. But in Coral Gables, he would stick with offense. He was one of only four true freshmen who played during Miami’s 2001 National Championship season, impressing coaches with his aggressive play on special teams. As a sophomore in 2002, Winslow led the team in receptions with 57 catches for 726 yards and eight touchdowns, averaging 12.7 yards per catch. He set a Miami bowl game record with 11 catches for 122 yards and a 7-yard touchdown in the first overtime of the Fiesta Bowl National Championship game. He was named 2002 first team All-Big East. Kellen would cap off his Miami career in 2003 by winning the John Mackey Award, given to the most outstanding tight end in college football. He was named a consensus All-American, and once again first team All-Big East. For the year, he led the Canes with 60 receptions for 605 yards, saving his best game for rival Florida State, where he pulled in 11 catches for 106 yards at a rain-soaked Doak Campbell Stadium to lead Miami to the 22-14 victory. He ended his career with 119 catches, the most ever by a UM tight end, for 1,365 yards, an 11.5 yards per catch average, and 9 touchdowns. He was the 6th overall pick in the first round of the 2004 NFL Draft by the Cleveland Browns and would play 10 years in the NFL with Cleveland (2004-2008), Tampa Bay (2009-2011), New England (2012) and the New York Jets (2013) catching 455 passes for 5,017 yards and 25 touchdowns. He was named to the 2007 Pro Bowl. Kellen and his wife Janelle have two children, son Jalen and daughter Juliana.